June 5, 2013 at 8:20 pm EDT | by Lou Chibbaro Jr.
An organization planning to install a National LGBT Veterans Memorial in D.C.’s historic Congressional Cemetery is inviting artists to enter a competition for the design of a monument “to honor LGBT veterans who have served in the U.S. armed forces” that will be part of the memorial. Nancy Russell, a retired Army Lt. 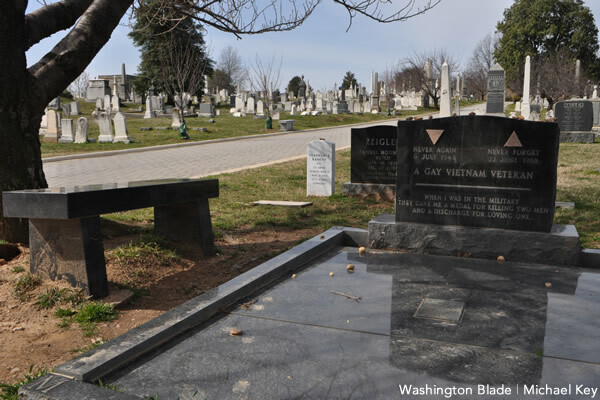 Colonel and chair of the board of the National LGBT Veterans Memorial Project, said the group has a contract with Congressional Cemetery for a site for the monument with the option to obtain more space if needed. A statement released by the organization says a deadline for submission of designs has been set for Oct. 15, 2013. Information about how to enter the contest and how supporters can make a contribution to help pay for the monument can be obtained at nlgbtvm.org or by emailing an inquiry to Chair@NLGBTVM.org.